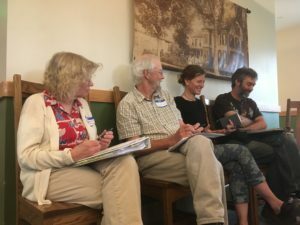 The final convening for Phase 2 of Land For Good’s Land Access Project (LAP) affirmed how collaborators across New England have improved assistance to farmers – land seekers and transitioning farmers – as well as farmland owners and service providers. Over 40 groups produced resources, built skills, and enhanced networks during the three-year project, which comes to a close at the end of August. Special thanks to the farmers who shared their land tenure and transfer stories – and gave project feedback: Janet Woodward & Tim Wheeler, Indian Head Farm, MA; Stacy Brenner, Broadturn Farm, ME; and Ryan Voiland, Red Fire Farm, MA. Cheers and beers for LAP2 collaborators shared their accomplishments as part of the project wrap-up at the Smuttynose Brewery (NH). 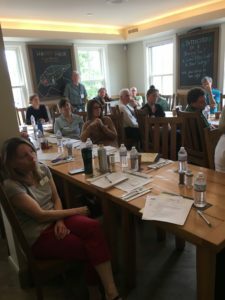 At the project’s final convening in May (Smuttynose Brewery NH), LAP task forces presented their accomplishments around farm access and transfer concepts, tools and regional resources. A farmer panel reminded us how land access and succession conditions can change, and how essential team-based assistance and innovation are to solving these challenges. Among the noteworthy project achievements are an improved New England Farmland Finder website, a comprehensive Farm Access Guide, training for succession advisors, an online Build-A-Lease tool, and a national conference. Also, metrics were presented that documented how direct technical assistance and educational workshops reached and benefited several thousand beginning farmer and other land seekers, transitioning farmers, and allied professionals. Funded by the USDA Beginning Farmer and Rancher Development Program, LAP is one of several dozen beginning farmer initiatives across the country; only a couple are focused on land access, tenure and transfer. The work lifts up LFG’s, and our region’s, leadership on these issues nationally. All LAP activities, from direct service to networking to over 50 educational events, are thanks to the steadfast participation of our many collaborators and LFG staff. Reflecting on our progress, contributions and shared goodwill, several participants shared their comments in the convening evaluation. More details about project deliverables will be shared soon at landforgood.org/our-work/land-access-project.